After having several long work weeks and quiet weekends to recover, the LundeRoys re-energized again. Saturday was a long day of Doing Cool Stuff. The above photo is of the Elisabet Ney museum which features sculpture made by a woman at a time when such a thing was unheard of. Her biography was really interesting and we were the only visitors for awhile, one of my very favorite things when it comes to museums. I climbed a narrow spiral staircase to the study on the top floor; it was too small for Austin to even attempt. Great views through ripply antique glass. Next was an exhibit on the history of photography at the University. We saw the first photograph ever and I was proud to recall learning all about this in my undergraduate French civ course. I still remember the lecture in South Hall, learning about Daguerre and his Daguerrotypes that began the development of modern photography. Yay, liberal arts! We ended the day seeing Social Network at our favorite movie theatre where we also enjoyed drinks and food. We both liked the movie and not just because the nice staff brought beer and wine right to our seats. Austin said their technical advisor did a great job and I appreciated the complexity of the main character, whether he deserved pity or should be written off. This morning I made really good pumpkin pancakes and taste-tested two kinds of cinnamon spice tea (Austin is rubbing off on me). Then it was errands and the usual Sunday stuff to gear up for the week. We're really looking forward to the Packer game tonight, hopefully it will be a nice close to the weekend and the start of a good week. It was an uneventful weekend here though we had a lot in mind going in to it. On Saturday afternoon, we went to a viewing party for the Longhorns game. It was hosted by one of the radio stations we listen to a lot and we got to chat with our favorite DJ a little. In addition to some good drink and appetizers specials, we were given a lot of promotional stuff (stuff being something we're currently trying to avoid so yeah). I'd been feeling a little under the weather all week and our hopes to go to a photography exhibit, a Monet exhibit, and maybe an interesting park didn't seem so realistic as Sunday arrived. Even Austin was feeling less than 100%. I'm glad we don't have a full-blown bug but we still don't have our usual energy levels. Fortunately we had the presence of mind to make a delicious, gooey pan of lasagne that is perfect comfort food and the leftovers just get better. We are also happy to have our Xmas flight booked and plans sketched out. As soon as I start looking forward to it, though, I panic with how much I have to do this semester. On that note, back to the books here. That's a photo of the flotsam and jetsam of my midterm writing process (ok, part of it). I just submitted my last paper (of two and a lengthy presentation) and now it's back to my regularly scheduled classes-teaching-proposing. There has been a lot going on with my dissertation committee and getting it organized but that finally seems to be heading in a positive direction. Austin has managed to refrain from adding to our 12 gallons of cider so far and instead installed a separate water filter spout on the kitchen sink. He actually drilled through the sink with a frightening cone-shaped drill bit but he doesn't seem nearly as nervous about creating holes in things as I would be. We put up some orange lights and set a few pumpkins out but have been disappointed that Target's Halloween decorations were picked over quickly. We don't want the huge spread but thought a few more things might be fun. Austin's greatest homeowner dream is to install color changing LED bulbs so he can leave them up permanently and program the color of his choosing depending on the season. He is undoubtedly his father's son (and uncle's nephew). Why stop at 10 gallons? Kelly and I wanted to try a few variations on the base apfelwein recipe but didn't want to risk a five gallon batch each time. 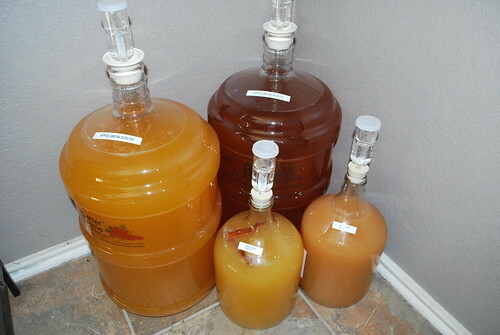 Luckily, apple cider is available in one gallon glass jugs so all I had to do was pick up a couple more airlocks and some smaller stoppers. The first test batch is the same base recipe with two cinnamon sticks thrown in. The second batch is the same base recipe made with unfiltered cider. It should be interesting to see how these compare to the original. A non-secret about me is that I love Real Mail. I love stationery and stamps and post marks and handwriting. I love email too but Real Mail is extra special and surprise packages, even better! I try to get the mail every day though Austin is more of a cynic, expecting junk mail and not much else. I always reply that there could be something cool, you just never know. Well, over the past 10 or so days, I've been very fortunate. 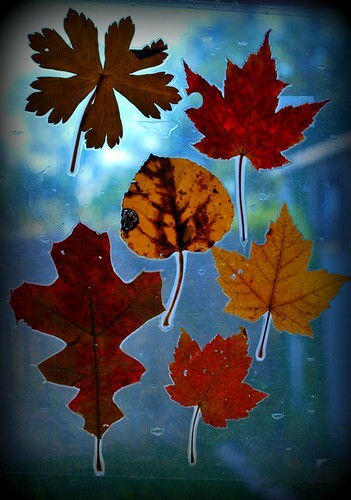 It's also no secret I love fall and my mom sent me several sheets of laminated leaves from WI. They are taped up in the windows and are a reasonable substitute for the real thing. I have noticed some foliage around here turning golden yellow, lots of acorns on the ground, and falling leaves. The color in my window is just the thing. I also got an out-of-the-blue package from CorgiMom who found me an adorable pair of socks featuring "Gourmet Girl" and a card informing me she has the same pair. As an extra bonus, the card was made by her good friend and the package postmarked from my hometown. Finally, I got a great package from my sister. Not only did I get a super cool shell bracelet from Hawaii and a "classy" bottle opener for our future ciders, but she also sent a copy of the photo book I had made for her 30th birthday. Seriously, three packages in less than two weeks! How lucky am I? P.S. Still writing my diss proposal for this coming week. P.S.2. Austin is currently making two more gallons of cider. P.S.3. I want to call our brand LundeRoy Libations and this line Armadillo Apple. Thoughts?